Gary Hickerson was born in Farmington, New Mexico on March 7, 1971. He was one of six boys. Hickerson was influenced at a young age by his father who was a foreign car specialist and a novice contemporary painter. The stories of race cars and high performance European automobiles gained his interest. He learned the trade of auto-body refinishing from his brother Robert while restoring his first car, a salvaged Volkswagen Beetle, and followed in the family tradition in automobiles. After losing his brother and mentor to suicide Hickerson decided to pursue his love for art. He attended the school of his grandfather at Southwestern Oklahoma State University. Southwestern currently exhibits a monumental steel sculpture that he produced as a student. He received a Bachelor of Arts degree in Education and in 1999 Hickerson was hired by Six Flags Corporation in his field as an artist. His primary job was to carve Warner Brother’s characters and props. He was inspired by the bulby and playful characters of Chuck Jones. While at Six Flags, Hickerson’s knowledge and experience with contemporary building materials and processes grew extensively. He left there in order to continue his education and the pursuit of his own identity and growth as a sculptor. Hickerson went on to study sculpture at the University of Oklahoma. At OU he received mentorship in both traditional figurative sculpture under artist Paul Moore and contemporary issues under artists Sebastian Mendez, Jonathan Hils, George Hughes, Jack Jordan, Dr. Andrew Phelan and many visiting artists such as Jim Waid and Elias Rivera. His experimentations in form led him to rediscover his past, combining it to produce his current body of work. Hickerson has received numerous awards in both figurative and contemporary sculpture and was nominated as a recipient for the Outstanding Student Achievement in Contemporary Sculpture Award from the International Sculpture Center in 2004. His work was exhibited in the October, 2004 edition of Sculpture Magazine and was part of a group show at Grounds for Sculpture in Hamilton, New Jersey from October 2004 to May 2005. 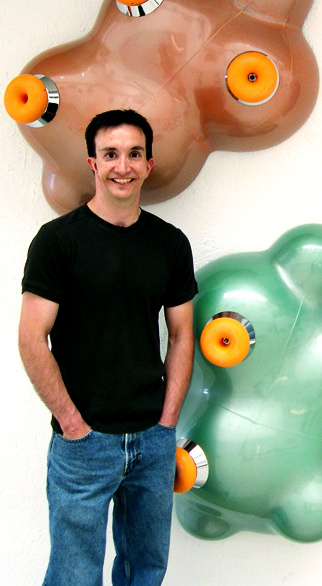 In 2005, Hickerson’s technical experience and surface treatments gained the attention of internationally renowned sculptor Jeff Koons. He and his family relocated to New York City to take a position with Mr. Koons as a metal and surface refinisher where he is actively working and taking part in the artistic and cultural influence of the city.